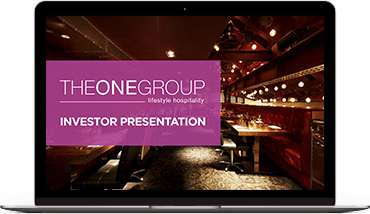 The ONE Group (NASDAQ:STKS) is a global hospitality company that develops and operates upscale, high-energy restaurants and lounges and provides hospitality management services for hotels, casinos and other high-end venues both nationally and internationally. The ONE Group's primary restaurant brand is STK, a modern twist on the American steakhouse concept with locations in major metropolitan cities throughout the U.S., Canada, Europe and Middle East. ONE Hospitality, The ONE Group's food and beverage hospitality services business, provides the development, management and operations for premier restaurants and turn-key food and beverage services within high-end hotels and casinos. Additional information about The ONE Group can be found at www.togrp.com.